Little Mountain Veterinary Clinic receptionists are often asked why an exam is needed for a pet. 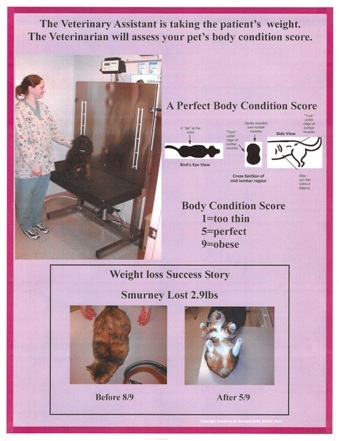 Owners often believe their pet is absolutely healthy and they only want the annual shots to be updated. Why is a Full Physical Exam needed Annually? 1. Animals hide their discomfort. Just as we hide our headaches or sore hip or back when we are out working or shopping, so do our patients. As a veterinarian I am frequently amazed at how stoic my patients are – they often will not show pain to their owners or to me when I know they are very painful. Some patients will even wag their tail, This is an instinctive survival necessity for animals. The weak do not survive in the wild. 2. For an adult dog as a rule of thumb the annual exam is approximately equivalent to once every 7 years, in a cat it is about every 4 years. So once a human year is totally reasonable and is good care. 3. During the full physical many problems are discovered by the veterinarian in apparently ‘healthy’ patients and concerns are discussed with the pet’s caregiver. The medical record records changes over the years and is referred to regularly. When an exam is done even if all is normal that is very valuable information as it provides a baseline for the veterinarian. What is a normal heart rate for one animal may be abnormal to another. The standards of care, or what is done during the examination of your pet is chosen by the veterinarian at a clinic. The above slide show shows what and why Dr Banyard does what she does during the annual physical exam at Little Mountain Veterinary Clinic. She will tell you what she finds. Other clinics may do this differently. Ask what your veterinarian sees during the exam so that you understand your pet’s health. The full or complete physical exam will take approximately 20 minutes. If this is not enough time to go over all the problems needed to be discussed another appointment will need to be made for further work.